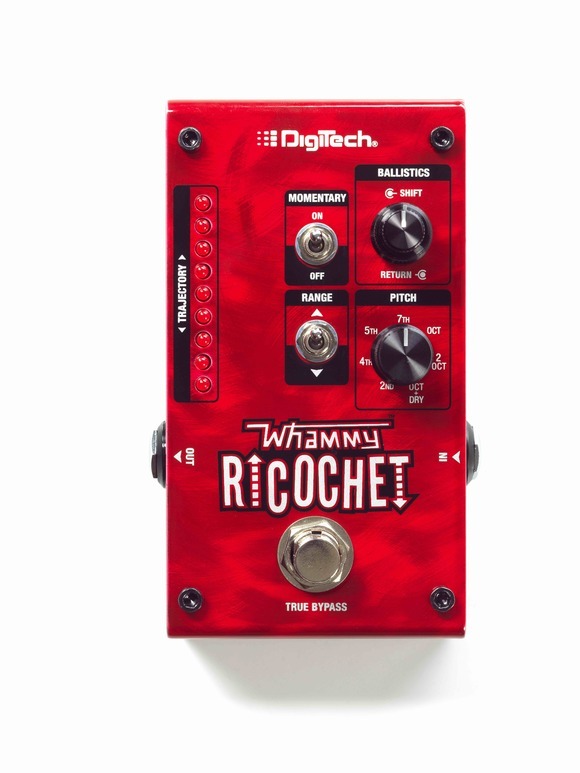 PL+S 2016, FRANKFURT—DigiTech by HARMAN today announced the Whammy Ricochet guitar effect pedal. The Whammy Ricochet takes the popular Whammy pitch shifting effect and places it in a pedal with a small form factor. Instead of using a foot treadle to manipulate pitch bending rate, such as those found on traditional DigiTech Whammy pedals, the Whammy Ricochet bends the pitch of the incoming note at a rate determined by shift and return controls. The Whammy Ricochet allows guitarists to bounce their sound up or down in pitch in controlled or crazy shifts. The Whammy Ricochet offers seven pitch selections: 2nd, 4th, 5th, 7th, Octave, Double Octave, and Octave+Dry, as well as a toggle to select up or down for the selected pitch. The Whammy Ricochet also has a latching footswitch mode so the tone can rise or fall to the selected pitch and stay there. An LED ladder shows the shift trajectory at all times. All these controls combine to create classic Whammy pitch shifting as well as new sounds never heard before. The Whammy Ricochet provides two modes of operation: the Classic Whammy algorithm and Chords, the modern algorithm from the Whammy DT. The classic mode is ideal for single note soloing while the chords mode is best suited for the pitch shifting of full chords. The mode can be changed while the effect is on or off. The unit’s responsive Trajectory LED Ladder lights in sequential order to provide a visual indication of pitch shift direction and rate. For example, the LEDs will light from top to bottom when the incoming note is shifted down. Conversely, the LEDs will light from bottom to top when the incoming note is shifted up. The Trajectory LEDs will also chase in the direction of the pitch shift so that you always know what direction is currently selected. To use the Whammy Ricochet pedal, select the desired pitch shifting interval with the pitch control then select the pitch direction with the range switch. Set the footswitch for momentary or latched operation using the momentary switch. To audition the rise and fall rate of the pitch shifting effect, turn the effect on/off using the footswitch; adjust the shift and return controls so that the pitch effect bends to and from the selected interval at the desired rate. The Whammy Ricochet will be available May 2016 at $187.44 MSRP.